Miller is hoping to test his tennis talents against the very best in the world at the U.S. Open. 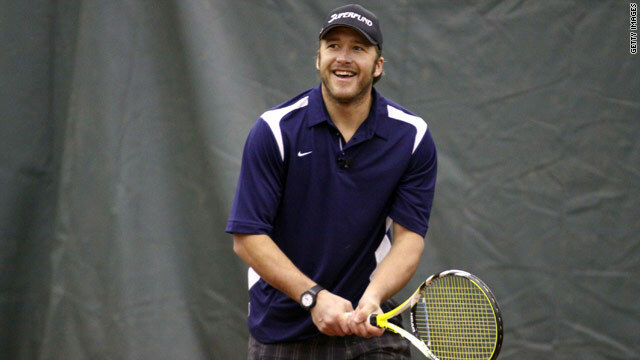 (CNN) -- Alpine skiing superstar Bode Miller is swapping the piste for the tennis court as he attempts to qualify for the U.S. Open championship at Flushing Meadow later this year. Miller will be competing in the sectional qualifying tournament in Honolulu, Hawaii on Thursday with the winner advancing to the U.S. National qualifying tournament in August where spots at the hard court grand slam will be decided. Millar last made the sporting headlines as he finally won Olympic gold at the Vancouver Winter Games in February in the super-combined event. He ended with a full set of medals after a silver in the super-G and bronze in the downhill, at last fulfilling his promise in the biggest arena of all. But the 32-year-old is also a notable tennis player and was the 1996 Maine State singles champion while his family won a tennis camp in New Hampshire. He gets his chance because of a new policy by the U.S. tennis association (USTA) to give anyone over the age of 14 the opportunity to play their way to the main draw at Flushing Meadows through a new national playoffs system. Miller, a two-time World Cup overall champion, sees his foray into tennis as a new competitive outlet ahead of the start of the new skiing season later this year. He is widely regarded as the greatest American ski racer of all-time with a record 32 World Cup victories and five Olympic medals, capped by his Vancouver triumphs.